Have you heard of the Pascal Triangle? In the above image we see a few rows of numbers, the top row having 1, the second row 1 1, the third row 1 2 1, the fourth row 1 3 3 1 ,etc. In the third row, the "2" is formed by the sum of 1 and 1 of the previous row as the small lines indicate. 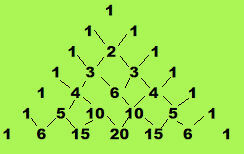 In the fifth row, the "4" is formed by the sum of the 1 and 3 of the previous row. In the same row, the "6" is formed by the sum of 3 and 3 of the previous row, right on top of the 6, etc. The very first and last numbers of each row is always 1. 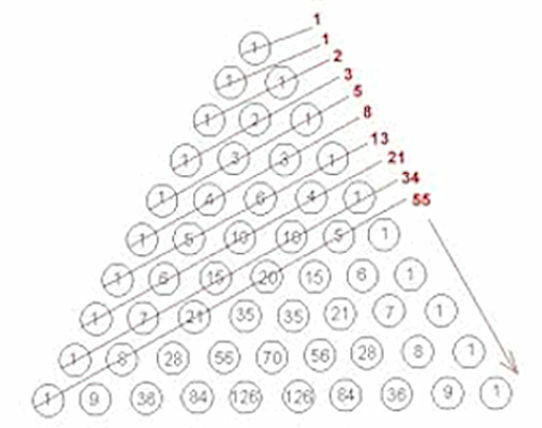 The Pascal triangle is usually useful for finding the probability of events where there are only two possible outcomes, such as heads and tails when flipping a coin or Banker and Player in Baccarat. For example, if you flip a coin three times, there is only one combination that will give you three heads (HHH), but there are three combinations that will give two heads and one tail (HHT, HTH, THH), also three that give one head and two tails (HTT, THT, TTH) and one for all Tails (TTT). This is exactly the pattern 1 3 3 1 in the above Pascal Triangle in row 4, meaning that there is only one way of obtaining all Bankers or all Players for those three bets, but three ways of obtaining two Bankers and one Player, or two Players and one Banker. 1 4 6 4 1. Well, now that you know what your chances and probabilities are to win, can you use the Pascal triangle to go to the casino and make profits? I don't think so, either. It's a useful triangle, but if you really want to win on the long run with small bets, you will need my new Triangle System, which uses different aspects of the triangle's features and characteristics. 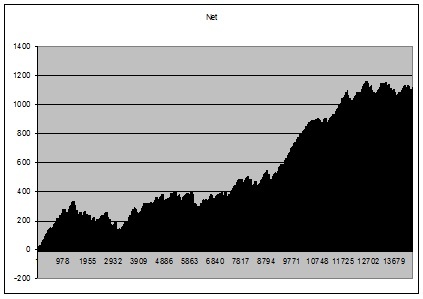 If you follow the diagonal lines and sum up the figures, yes, you get the Fibonacci sequence, that we are all acquainted with and some gambling systems have been devised using this sequence. The Triangle System will use Pascal's Triangle in a very special way and you will be certainly amazed with the results, whether you use it for even bets in Baccarat, Roulette, Craps, etc. or dozens in Roulette. Just to give you an idea, the Triangle system beats all Zumma tester books, the 600 shoes and the 1K in all Zumma and random mode. For the Zumma 600 shoes, it generates 2162 units. For the Zumma 1K shoes, it generates 1322 units for the first half and 1778 units for the second half. Thus, a total of 5262 units are generated for the 1600 Zumma shoes, averaging 3.3 unit per shoe. Since your highest bet never exceeds 20 units, you can use any chip denomination that your budget allows. All those results are shown in MS-Excel simulations and will be provided to you upon your purchase. You may request different bet selections that will show the same type of results. 5 units were the overall drawdown relative to the initial use of the system. The system will be very easy to understand and immediately applicable to start making profits with it within minutes. The system document is not more than 15 pages with numerous examples of different situations, in fact, all situations to consider, from the worst to the best case scenarios. The system is not of a grind type, that generates only 1 unit per run, but multiple units. Abandoned runs can be as low as 5 units. In short, with a very small amount of bankroll, such as 40 units per session and 80 units lifetime, you will be able to win a lot with the Triangle system. Even the price of the system is within budget. For not more than $200, you can get hold of this great Triangle system. And yes, as always, you can have an early bird discount and have 50% off on the system and purchase it for a mere $100, if you place your order by the end of May 2017.